Thảo luận trong 'ENGLISH' bắt đầu bởi Bato Prosic, 11/9/18. Music licensing provider Music Vine has just released a major update to their interface, reinterpreting both the way users search for music, as well as license it. 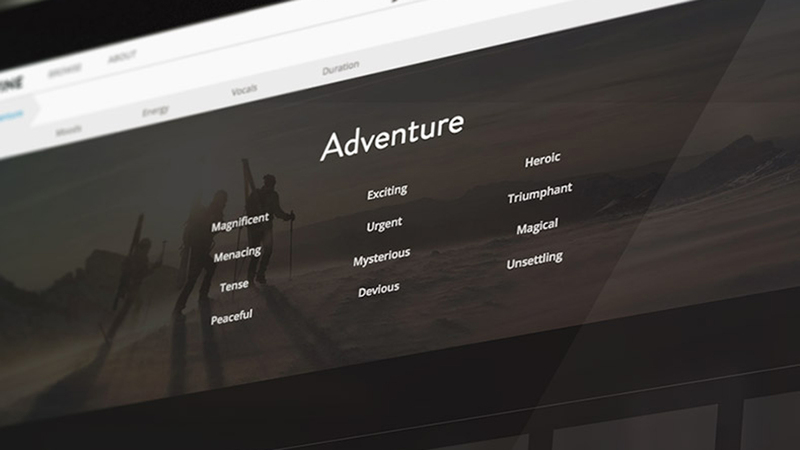 The site has overhauled search categories, added focus terms and new filters and changed their licensing structure and workflow. In addition to that functional overhaul, Music Vine has gotten a pleasant, contemporary facelift. Is it useful? Let’s have a look. So you have a project, maybe it’s already shot and now you need some music for it, something that fits, something that underscores what you already see in the footage you have shot. Then you get to searching and two hours later you still aren’t even sure you have the right category selected and you start doubting your skills, the site your on, your project and life in general – not necessarily in that order. Pardon the dramatization, but also please just accept that at some point you might face the same challenge. This is where music licensing services differentiate themselves from each other. There are those that feel like they are working against you and the rare ones, that feel like they are actually helping you. Music Vine’s interface overhaul is meant to put it firmly in the latter category. As with any music licensing services your goal will be to start with some broad strokes and then narrow down the kind of music you need, until only a few sensible options are left. 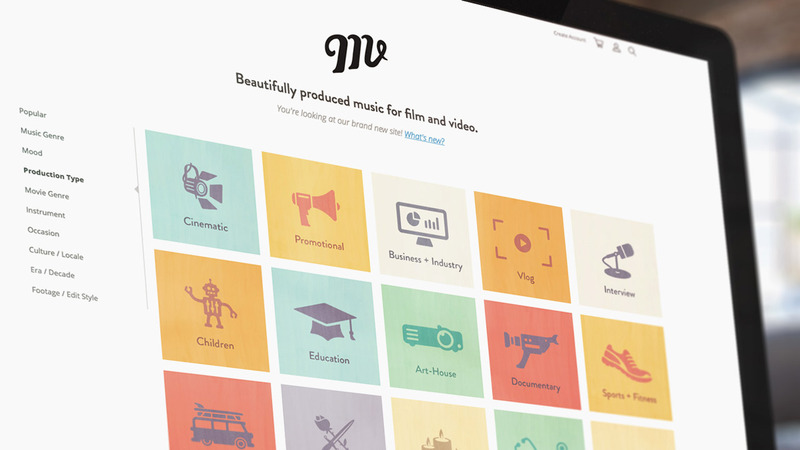 The categories Music Vine offers are useful, well ordered and timely and allow you to choose from categories that are tried and tested standards like Mood, Production Type, Genre or Instrument, as well as more exotic ones like Culture, Era and Edit Style. Particularly Edit Style seems very useful, offering tracks tailored to categories like Slow-Mo, Fast Cut, Glitch or Timelapse. Of course these will be hit-or-miss for some people, but in general if you have some experience searching for music, you will know the conventions of those categories and will be able to interpret them accordingly. Offering 102 style categories, Music Vine has you covered here. Upon selecting a category you get to see the so-called Focus Terms for that category. These are meant to narrow down the selected category to a certain shade of possible moods. There are 381 unique Focus Terms. To be clear: Focus Terms can repeat across categories, but they have their own descriptive power apart from them. Testing this I wasn’t sure it would be helpful so I started out with something rather easy: selecting Production Type: Education, I got the following focus terms: Aspirational, Grandiose, Fun, Intelligent, Instructional. So far so good. Those all seemed descriptive. Let’s try something harder. I selected Mood: Cool and the Focus Terms I got back were: Rebellious, Edgy, Bold, Easy and Smouldering. Of course everybody has to judge for themselves, I can say I found most of the terms rather evocative and helpful. The last step in narrowing down your selection is filtering and sorting. 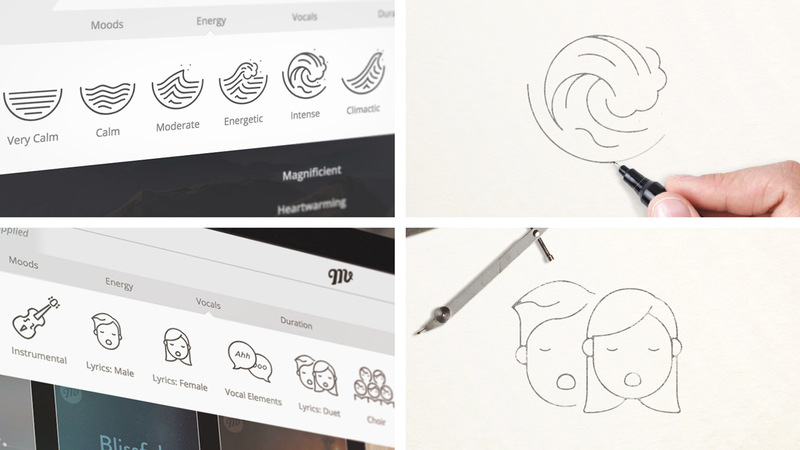 Music Vine offers filters for mood, energy, vocals and duration, notably leaving out tempo. You can then sort these by relevance, undiscovered, latest and alphabetically. What comes into play here, is Music Vine’s weighted tagging system. This means that tracks won’t just be tagged once with a style or filter, but every track can have multiple tags assigned to them, with different priorities. That makes sense as any track could be used with different intentions in many different scenarios. Obviously it’s hard to compare this to the way categorization and filtering have previously worked, so I can only say, that I was rather pleased with the outcomes. Of course you can also make playlists, or favorite tracks you liked. When you’ve found a track you’d like to use you get to choose a license type and then your coverage. 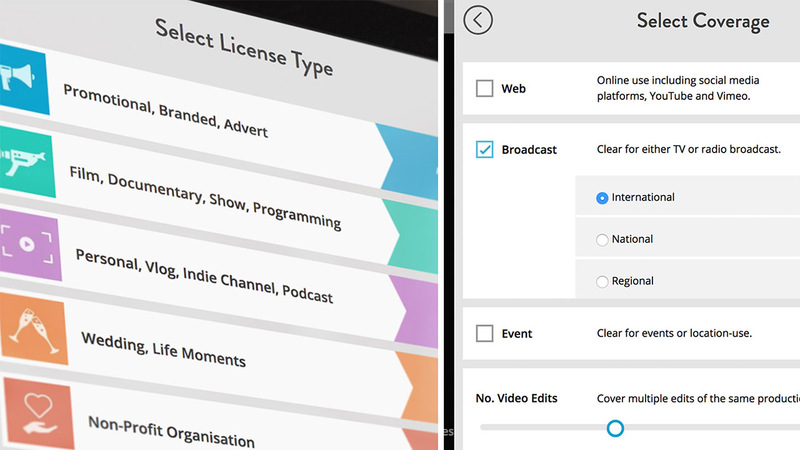 License type will narrow down the character of usage, while coverage will offer avenue of distribution and number of edited versions, as well as usage for events. This is all pretty self-explanatory, which in itself is a commendable achievement in offering and selling licenses. You don’t have to be a lawyer to understand what is going on here, and prices are updated in real time, making the whole process remarkably streamlined. A word on design: Music Vine’s visual redesign is pleasant, evoking creativity with lots of icons and visual cues in handdrawn styles, yet subtle enough to never get in the way of the functional aspects. Rather it is just playful enough to be fun and not boring, but it doesn’t overstay its welcome. The omission of the tempo filter is something I find completely understandable. There is a point where there are too many filters on your search and you will sensibly just get two tracks back, or even worse zero, thus making your search useless and prompting you to start from the beginning. In my experience the tempo filter is the most likely culprit for that on most music licensing services. On the other hand there are occasions where you might only want to select a production type and a tempo, because you know that is what you need. If there are any downsides to Music Vine’s great improvements in categorization, it might that there are simple scenarios where the categorization model seems too sophisticated or opinionated. However in practice I got very good search results by just using the energy filter instead of tempo, so take this with a grain of salt. Another thing I’d like to see on more music licensing sites and Music Vine as well is better compatibility to mobile phone browsers. Better yet, why not even a dedicated application? Nonetheless Music Vine’s huge overhaul, four years in the making, has definitely payed off. The whole process of searching, discovering, filtering and then licensing music is understandable, transparent and at times even pleasurable, while keeping the efficiency pretty high without hamstringing the results. If you want to try the new and overhauled Music Vine, just head over now. Do you like Music Vine’s new search capabilities and the updated design? Will you give it a shot and license your next project there? What other changes would you like to see coming to music licensing? Let us know in the comments. The post Music Licensing Reinterpreted: Music Vine Gets Massive Interface Overhaul appeared first on cinema5D.